I have wanted to draw more and use my kettlebells at least once a week. So the time? Where does it come from? I’m going to try to get it from less blogging and time on facebook. Also less shopping. I find drawing about the most relaxing activity, but it does take effort, probably more than those other things that have been eating up my time. Once I start, though, I’m absorbed so that’s the trick. For now I’m going to try drawing on the days I don’t exercise. That block of time will be for one or the other. I’m going to see how it goes. This deer needs a lot of work, but I see them almost daily very close to the house so I get some great shots of them from which I can work. Since the landscape is pretty bleak right now they add some interest. I love their ears! By the way, the kettlebells have been used 2 weeks in a row. 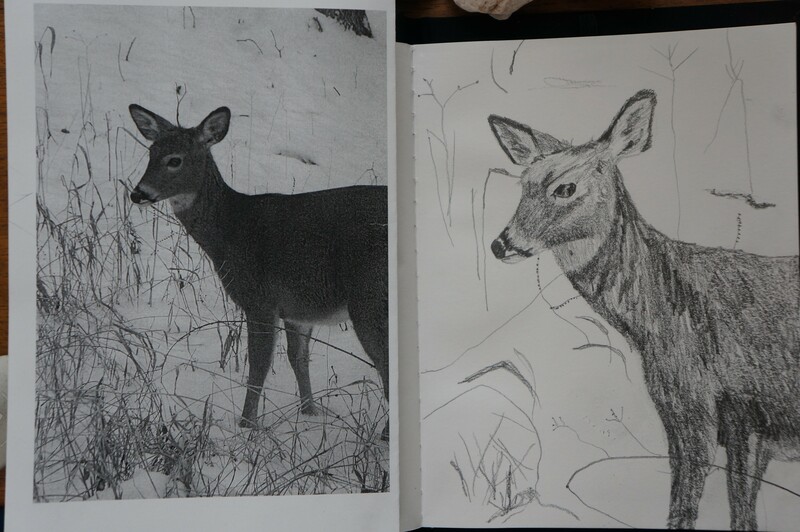 Today was the first day for drawing in 2014. We’ll see how long it lasts!